The Over-the-Rhine Foundation is hosting a design competition to test a proposed set of new infill guidelines for the Over-the-Rhine community. The OTR Design Competition Awards Ceremony and Celebration will take place on Friday, March 23rd from 5-8 PM. The event will announce the winner of a competition designed to evaluate proposed guidelines for new development in the revitalizing neighborhood. Since 2014, the Over-the-Rhine Foundation’s Infill Committee has focused on advocating for contextually appropriate infill design to complement the neighborhood’s rich historic fabric. 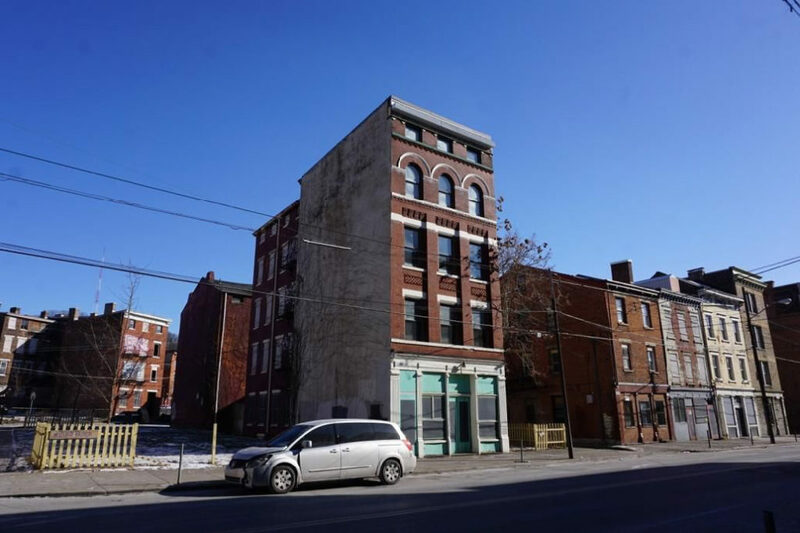 As part of this effort, the committee has worked to revise the outdated new construction guidelines for the Over-the-Rhine Historic District. 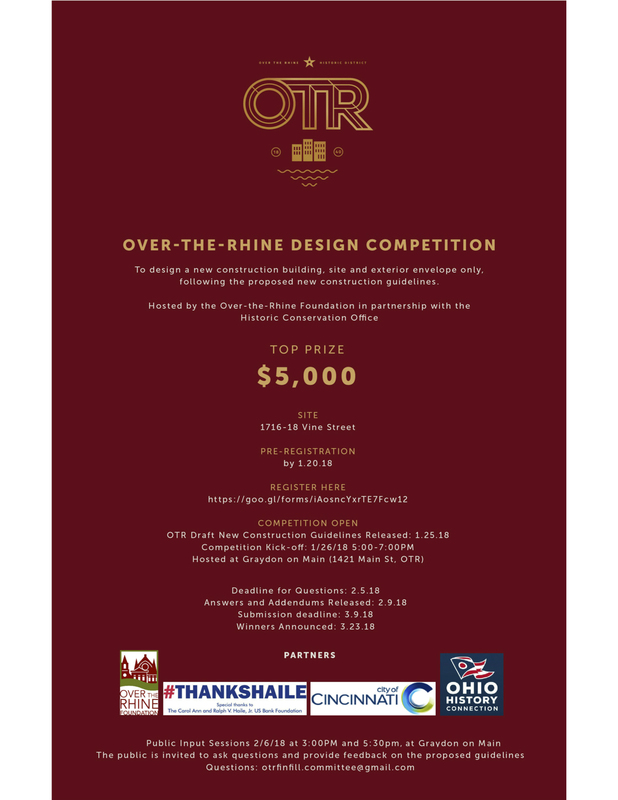 The Foundation is currently hosting the OTR Design Competition to challenge the design community to elevate new construction in the district while testing the proposed guidelines. Twelve local and national architects and designers work to design a hypothetical new construction project in the Northern Liberties portion of OTR at 1716-18 Vine Street, north of Liberty Street. The intent of the competition is to present designs that will elevate the standard for new construction in the neighborhood and city. Foundation members hope that the design guidelines would inspire other cities to look to Cincinnati when it comes to inspiring contemporary architecture in a historic setting. Partners in the development of the revised guidelines include the Over-the-Rhine Foundation, City of Cincinnati Office of the Urban Conservator, The Carol Ann and Ralph V. Haile, Jr./U.S. Bank Foundation, and Ohio History Connection. Sponsors of the competition include the Over-the-Rhine Foundation, Cincinnati Preservation Association, 3CDC and the Niehoff Urban Studio. The competition awards ceremony will take place at Union Hall’s 200-seat Beer Hall at 1311 Vine Street in Over-the-Rhine on Friday, March 23rd from 5:00PM-8: 00 PM. The presentation will begin at 6:00 pm. The ceremony is open to the public but RSVP‘s via Eventbrite is appreciated by Monday, March 19th. Complimentary beer and light snacks will be served with a suggested donation of $5.00. Donations can be made by paying to the order of ‘@OTRFoundation’ on Venmo or by cash or card at the event. The event is conveniently located along the Metro bus routes #46 and #78. It is a block away from the Northbound 12th and Vine and Southbound Race and Washington Park Cincinnati Bell Connector Streetcar stops. It is also located within a block from two Cincy RedBike bike share stations. Editor’s Note: Mr. Yung is a member of the Over-the-Rhine Foundation Board of Trustees.